When spring is finally here and the days are getting longer and warmer, it’s time to book your pool opening to get your backyard oasis ready for summer! For pool owners, one of the most daunting tasks can be opening your pool for the season. Selleck Pools Inc. offers a comprehensive pool opening service that includes everything from removing the winter pool cover to scrubbing the waterline and checking the chemical balance of the water. Pool openings are scheduled for early spring. 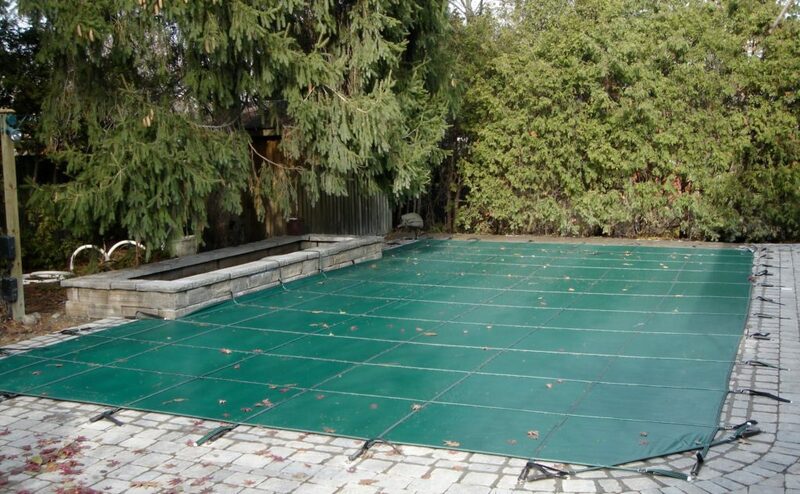 While your pool is closed, the cover accumulates water from melted snow and rain. It’s important to avoid mixing the water on the top of the cover with your pool water. Every pool opening begins with our crew carefully pumping water off the winter cover and removing debris. We’ll even take the debris to your curbside for easy pick up. Next, we pressure wash, clean and fold the winter cover for storage. We’ll pressure wash, clean and roll up water bags as well. After the winter cover is safely stored, our pool opening experts will scrub and clean the pool’s waterline. Different types of pools require different care and inspection during openings. For pools with vinyl liners, we check for holes or tears and recommend any needed repairs to prolong the life of the liner. For fiberglass pools, we inspect for major cracks or damage that may have occurred during a particularly harsh winter. Next, we vacuum the pool with our industrial equipment and check the water’s chemical balance. We securely re-install any pool deck equipment, including ladders and diving boards, and pressure wash the pool deck area. We’ll restart any pool equipment, such as the heating and filtration systems. Our experts will prime the circulation equipment and check for leaks in the filtration system. Finally, we’ll skim the surface and super-chlorinate your pool. Selleck Pools Inc. offers a complete pool opening service in Scarborough, Ajax, Pickering, Markham and the surrounding areas. To book your pool opening, call 416-724-8649 or fill out our online contact form. Once your pool is open, we’d be happy to schedule regular maintenance and a pool closing in the fall. Our pool openings take 1-2 days, depending on whether you have an above-ground pool or inground pool. Our technicians can also open an inground pool’s attached spa for a small additional fee.